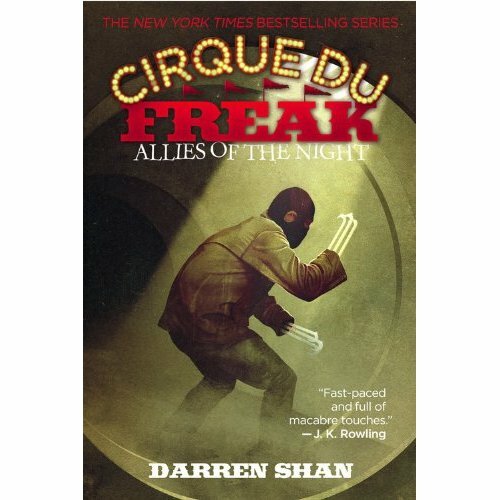 Cirque Du Freak Book 8 was about young half vampire Darren Shan who is traveling the world with 2 other vampires and a little person. In the book Darren was on the search of the Vampaneze Lord. They searched in the city where Mr. Crepsley was born where they found the Lord in the tunnels under the city. The team of vampires had some help by a young school teacher and Darrens old friend from school who grew up to be a vampire hunter. When they found the Vampaneze Lord in the tunnels. Darren noticed a man that used to be his friend from the Cirque Du Freak. Then the Vampire hunter on there team betrayed them, Because he was working for the vampaneze all along. They took him hostage back at there base. Then the cops came to the apartment home that was there base and had it surrounded and accused them of killers. They were arrested and brought them to jail to ask them questions and the book ended there. If you want to get started with the Cirque du Freak series, the WHS library owns The Vampire’s Assistant and Other Tales from Cirque du Freak. Twilight is a captivating story about the complex love two people can share. Bella Swan moves to Forks, Washington to live with her father. Her first day of high school consists of her feeling hated by the most beautiful guy she has ever seen. This boy is Edward Cullen. Edward attempts to convince Bella to stay away from him for her own safety, but there is no hope. Soon they fall in an undeniably deep love. There’s only one problem… Edward’s a vampire. Twilight paints a picture of an impenetrable love only made more spectacular by the fact that at any second Bella could be killed by the one thing she feels the need to live for.